P.S. The George/Gracie/Basil header is fantastic! Ivan, I am honored, having been a fan and reader of your site, "Thrilling Days Of Yesteryear," since its beginning. You always seem to be first with news about DVD releases of classic TV, and your writing is always informative and entertaining. Thanks again for picking Greenbriar. I have to agree with Axe. 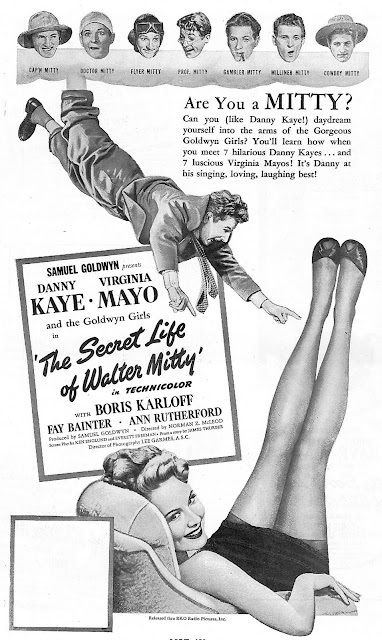 Danny wears a bit thin, but Virginia Mayo is always worth watching. And the Goldwyn Girls are always worth a look, too! I agree with you all the way about Kaye. But MAN wouldn't that Karloff piece be GREAT to see! 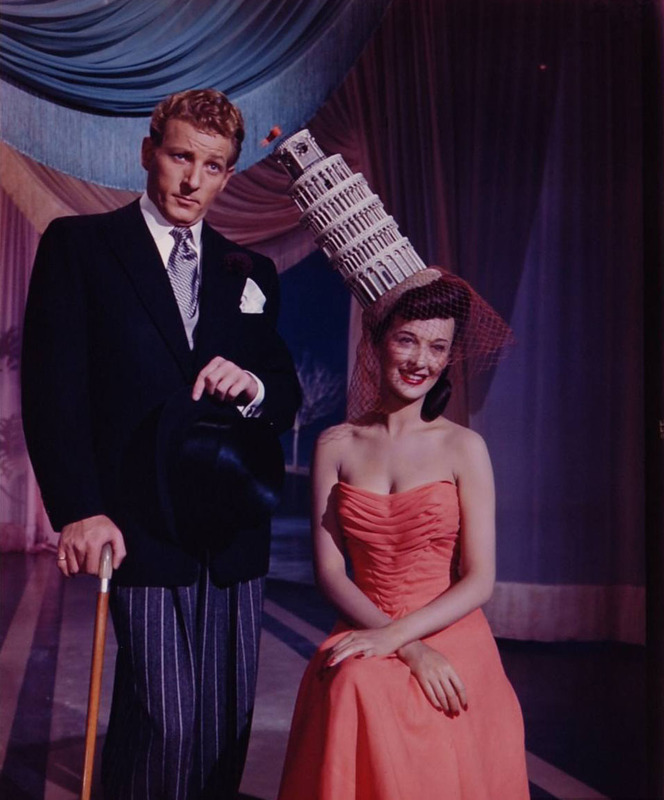 I was going to movies in the 1940s and 1950s and usually avoided any featuring Danny Kaye. His comedy was a bit too broad for me. I did enjoy WHITE CHRISTMAS and THE FIVE PENNIES, which were not his typical fare. My favorite movie comedy of the 1940s was HOLD THAT GHOST with Abbott and Costello. They were not quite so crazy or rude to each other in this one and it also had Joan Davis. But then I was a kid back then. I left any interest in slapstick of any sort behind as I grew into my teens and learned to appreciate clever dialogue. Eve Arden's wise cracks can still break me up. Another fantastic entry, John. Your writing continues to thrill. And once again, your point of view matches my own thinking in regards to Mr. Kaye. At a very early age, I found Danny Kaye insufferable. He always seems to be a little bit too thrilled with himself. Saw a few of his films, and never liked a single one. Then actively avoided him. Now, every time I see even a few minutes of "White Christmas," I wonder how in heck they didn't sign up Bob Hope for that Danny Kaye role. Hope and Crosby, Christmas, how could they go wrong? If they had co-starred Hope, that movie might be an evergreen and not just an endurance test. Danny Kaye was packaged as a song & dance man AND a clown, so nearly all his vehicles tried to be equally musical and comedy, usually coming in at half-strength on both. Kelly and Astaire could be funny between songs, Hope could toss off a nice number between one-liners, and even Oliver Hardy could serve up an appealing vocal when not dealing with Stan, but their emphasis was clearly one or the other. While Kaye kept up the event pictures longer than most, he wasn't certainly alone. Abbott and Costello only got color on a couple of late films, but some of their early features were also comparatively lavish with musical numbers, guest acts and effects gags. As time went on, the films were stripped down to bridging scenes between A&C bits, a vestige of a romantic subplot, and stooge-level violent slapstick. Bob Hope's thrillers and costume pictures used lavish productions purely as setups for throwaway quips. 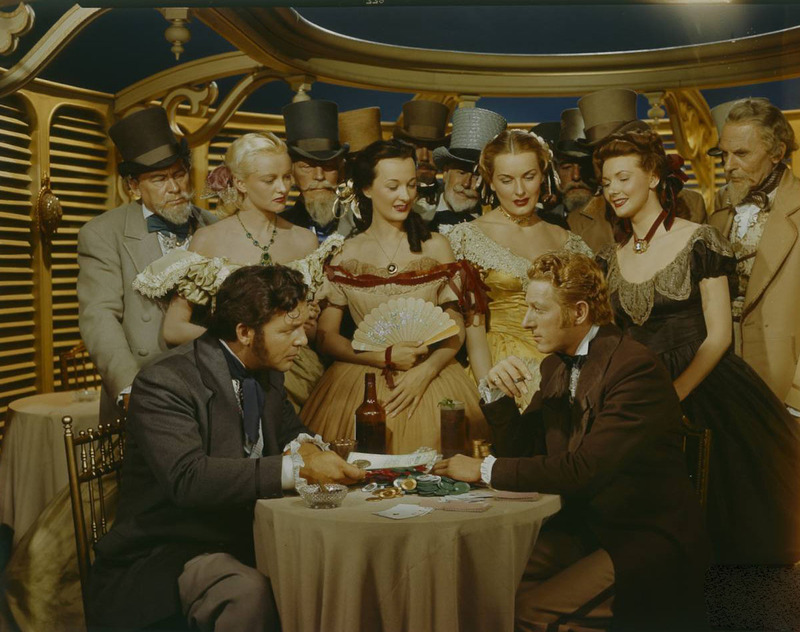 Red Skelton's films weren't that big, but they weren't cheapies, either -- Southern Yankee had at least one non-stock battle and Excuse My Dust was a respectable period piece. Martin and Lewis also had an expensive look after graduating from My Friend Irma, and some of Jer's solo pics were absurdly extravagant. Recently saw Merry Andrew, which I think was one of the last of Kaye's epics. As always, Kaye sings, dances and clowns (literally this time) almost nonstop. It felt a bit different -- They seemed to be going for a "modern" musical, with a focused (if predictable) plot and real exteriors instead of obvious soundstages and backlots. Dated, but you had to appreciate the professionalism. I can handle Danny Kaye in WHITE CHRISTMAS, but that's about it. Never got through an entire episode of his CBS variety series either. Count me in as one of those who never found Danny Kaye funny, even when I was a kid and would respond to almost anyone pulling a wacky doubletake. There was something about his "nice" persona that, even to an eight year old, seemed phony to the core; in fact, he struck me as somewhat angry and bitter everytime I saw him, especially on TV appearances. I just discovered your blog for the first time and spent the entire morning scrolling through it. This site is pure gold! Oh, and Thurber fans might want to watch Keith Olbermann's "Countdown" every Friday. He is now reading selections from Thurber to close the week, a pleasant way to enter the weekend. P.S. Love the Carole-and-cat header. 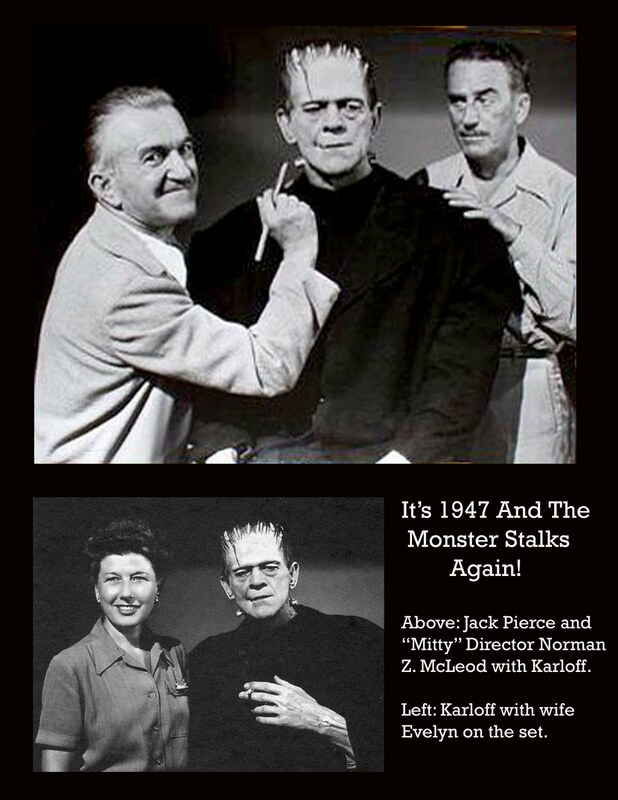 Oh my goodness - I never knew about Karloff donning the Frankenstein makeup for this Danny Kaye epic! Thanks to you, John as well as Mr. Newsom and Mr. McQueen, I now have a terrific extra tidbit to include in my Scared Silly blog/book on classic horror-comedies. In fact, I may very well have to link to your entries. 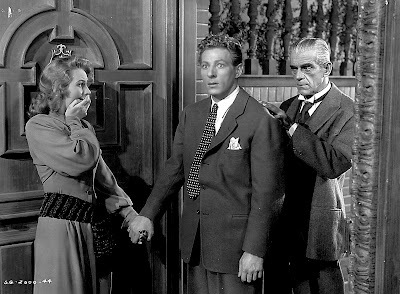 The implications are particularly staggering when you realize that "Mitty" was 1947 - a year before Glenn Strange donned the neck bolts to meet Abbott & Costello! There is already such a great backstory on that film - to the point where there are even semi-conflicting accounts floating around - that adding this Karloff-meets-Kaye info only enhances the lore. 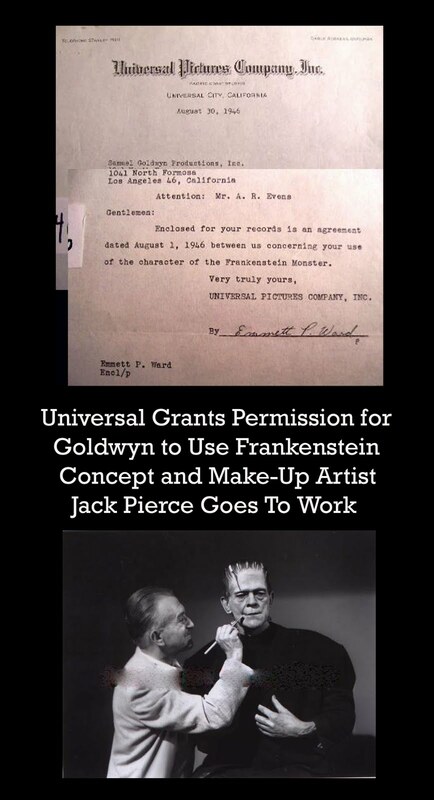 It also underscores that Karloff could be quite cool indeed - contrary to the reports that he became anti-Monster (or at least reluctant to relive it) after the third Frankie film. And he already proved that he had a good sense of humor when he played the monster in a cameo in Olsen & Johnson's madcap "Hellzapoppin." I seldom missed Danny Kaye's TV variety show ("Welcome to Talent Playhouse. I'm your host, Noel Talent..."), but I must admit, Kevin K.'s point about anger and bitterness is well-taken and perceptive. In A Biographical Dictionary of Film, David Thomson's comments soften from one edition ("...how could this wildly uneasy show-off have been so popular?") to the next ("...one of those people who was a wonder once, but who looks frantic and alien now. "), but that first-edition question still hangs there. Will people 50 years from now be similarly scratching their heads over Robin Williams? I had a college professor in the '60s who idolized Kaye, having been a teenager in the '40s; maybe that was what it took. He saw Kaye first and foremost as a clown, one who sang and danced, sorta, now and then. I expect that's how Sam Goldwyn also saw Kaye, as the new Eddie Cantor -- because that's exactly how he showcased and sold him. The Court Jester for Paramount is good..and The Inspector General for Warners drew some genuine belly laughs out of me..and I enjoy White Christmas and Hans Christian Andersen..but those big MGM color gang bangs are a real chore to watch! ugh! When I was a kid KNOCK ON WOOD was very funny, but I haven't seen it since. Kaye is an acquired taste which I don't think I've ever really acquired, but THE COURT JESTER stands as some kind of '50s masterwork, with one of the funniest and smartest screenplays of the period, and Kaye is great in it. Regarding Jim Lane's comment: I've been scratching my head over Robin Williams for about 20 years. According to Garson Kanin, during Kaye's entire tenure at Goldwyn, Sam, true to form, called him "Eddie". My father, who was about as much of a Danny Kaye fan as Iam a nuclear scientist, would carefully scrutinize the "production numbers" on either "The Kid From Brooklyn" or "Up In Arms" whenever it was on. He was dating one of The Goldwyn Girls at that time named Martha Montgomery and would be looking for her. Dad told me that Martha took him to a "wrap party" at Danny and Sylvia Kayes' house and Kaye was "on" all the time, something Dad did not find amusing. P.S. I too love "The Five Pennies" though I'm sure Satchmo and the music sell it for me more than Kaye does. Jeff, I'd heard often that Danny Kaye was not a nice guy offscreen. Could this be part of the reason he's not so well regarded today? Interesting about Kaye always being "on", RJ. Somehow he seemed like the type who would be. Dave K, there is something appealing about badly dated comics and their comedies. And I kinda like Betty Hutton, by the way. Joe, "The Court Jester" is one of my favorite 50's features. Wish Paramount would issue it on Blu-Ray, but what are chances of that? 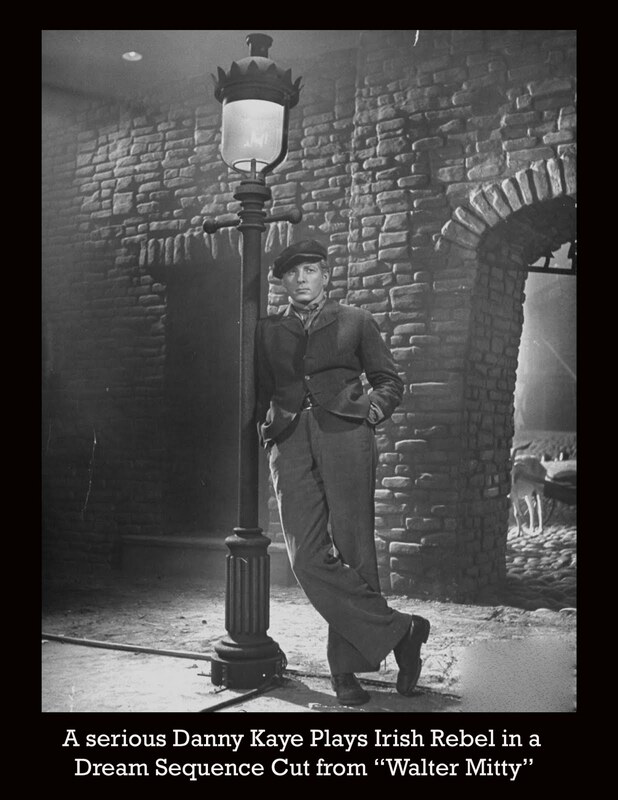 Jim, I wouldn't be surprised that those who idolized Danny Kaye in the 40's still do. It's a little like fans who grew up seeing Martin and Lewis first run. Paul, your "Scared Silly" blog is a pip. Really enjoy your writings there. Shawn, I'm so glad you've found Greenbriar and I thank you for the kind words. By all means, consult the Search Archive for easy access to prior posts, plus name and title index. I also remember the George Carlin story (speaking of which, I was surprised over the years at how many entertainers around George's age all said they got into show business because they "wanted to be Danny Kaye"). Anyway, as the story goes, young George met his idol coming out of a theater, who refused an autograph ("I don't do that") and walked right by him. Poor kid. I didn't realize that so many people HATED Danny Kaye!! I thought he was hysterical!! Granted, I haven't seen ALL his films, but I still think that, pound-for-pound "The Court Jester" is one of the funniest movies ever made. It still holds up today and the gags are still hilarious. How many "contemporary" comedies are going to be able to say that in 50 years? Mr. Castiglia: Karloff is not in Hellzapoppin. The Monster was played by Dale Van Sickle. It's a shame that the Karloff monster footage has not survived. I'm an Ace! John called me an Ace!!! 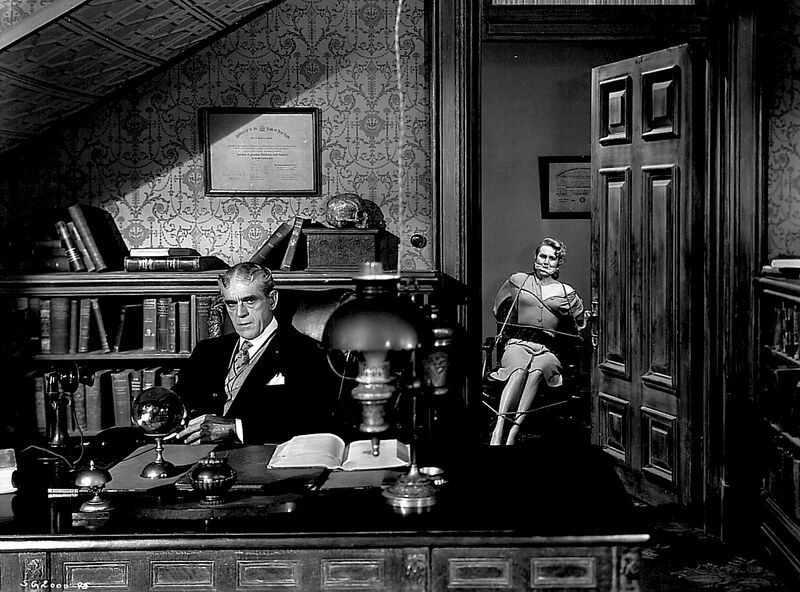 I noticed that THIRD photo from the session showed up, with just Pierce and Karloff. Since only one of these photos was known to exist 10 years ago (and then, misidentified as from the 1940 baseball game), I figure it's only a matter of time before someone finds the excised footage too. As good as THE COURT JESTER is, I think it would have been better with Bob Hope.